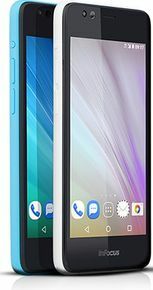 Infocus Bingo 21 is an entry level handset which promises 4G LTE connective and decent hardware wrapped in a reasonably attractive design, considering the price tag. The Infocus Bingo 21 online price in India is 5,499 on Snapdeal, which is also the lowest price of Infocus Bingo 21 at the time of writing. The handset is quite compact with a 4.5 Inch display with 854 x 480 pixels spread across it. Under the hood, there is 1.5 GHz quad-core Spreadtrum SC9830 processor with 2GB RAM and 8GB internal storage. The chipset makes its suitable for basic users, who are switching from feature phones to smartphones. Software is Android 5.1 Lollipop based Inlife UI. For photography, Infocus Bingo 21 includes an 8MP Auto Focus Camera with LED flash, f/2.2 aperture on the rear. The company has always been generous with Selfie hardware. It won't make a world of difference but the 5MP selfie camera comes with its own LED flash. Its a dual SIM handsets and to support 4G LTE and all that hardware, there lies a modest 2300 mAh battery. The Infocus Bingo 21 is meant for first time buyers looking for basic Android experience. The Infocus Bingo 21 will be available in 3 different bright color options - White, Blue and Orange colors. You can buy Infocus bingo 21 online India from Snapdeal for 5,499 INR. Everything is aswime.. No comment..